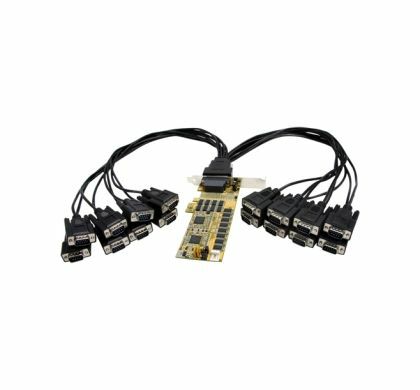 The PEX16S952LP PCI Express serial card (16950 UART) lets you turn a low profile PCIe slot into sixteen RS232 (DB9) serial connections. 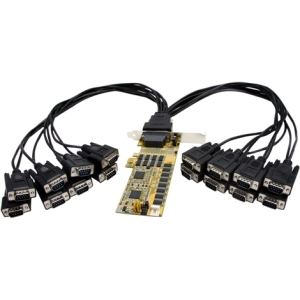 The serial adapter card is based on a native single chip design that allows you to harness the full capability of PCI Express (PCIe), delivering optimum reliability and speed while reducing the load applied to the CPU by as much as 48% over conventional serial cards. This low profile serial card is compatible with a broad range of operating systems, including Windows 2000, XP, 2003, Vista and Windows 7, and features a VHDCI 68 pin connector and serial breakout cable for installation into a single low profile expansion card slot.The card also includes a full-sized bracket, for installation in standard form factor computers.